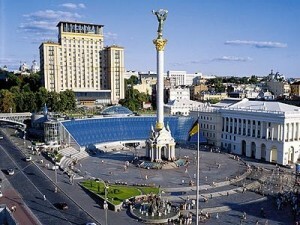 Arrival in Kiev, optional transfer to Hotel Radisson Blu Kyiv**** or similar, check-in, welcome meeting. Founded in the late 9th century Kyiv is one of the oldest cities of Europe and the cradle of Slavic civilization and Orthodox Christianity. The morning sightseeing tour introduces us to the historic city and all its treasures including St. Vladimir’s Cathedral, Golden Gates, St. Sophia Cathedral, St. Michael’s Golden-Domed Monastery, which we reach by cable car, Independence Square, Opera House and St. Andrew’s Cathedral. The afternoon is reserved for an optional excursion to the world famous Cave Monastery featuring amazing architectural monuments, ranging from bell towers to cathedrals to underground cave systems and strong stone fortification walls. In the evening enjoy an optional dinner with folklore music at Restaurant Opanas. The morning offers an optional excursion to the large Pirogovo Ethnographic Open Air Museum, where farmsteads, wooden churches, windmills and village architecture from all regions of the large country will bring us back to the atmosphere of 18th and 19th century rural Ukraine. In the afternoon is offered an optional visit to St. Sophia’s Cathedral and the National History Museum. The St. Sophia Cathedral – built in 11th century – is an UNESCO heritage monastery complex with unique ancient frescoes. The visit includes also Bell Tower, Monks Reflectory and Metropolite House. We proceed to the National Historical Museum with over 800 thousand unique exhibits related to the history and culture of Ukraine. The early morning is reserved for an optional visit to the unique Chernobyl Museum dedicated to the 1986 Chernobyl disaster, which also signaled the beginning of the end of Soviet Ukraine. In the afternoon we go to the train station to board the modern high-speed train bound for Lviv. Upon arrival in the evening to Lviv, transfer to Hotel Dnister**** or similar, check in. Lviv is known as the center of West-Ukraine, which was never incorporated into imperial Russia but was a part the Habsburg Empire. Even Lviv has had an enthralling and violent history it still has a unique old-world charm. The morning sightseeing tour takes us to Lviv Old Town – a complex of stone buildings from the 14th-16th century – and includes the Market Square with City House, Black Stone Building, Opera Square, Kornyakt Palace, Medieval Pharmacy-Museum, Armenian Cathedral, Dominical and Bernardine cathedrals and the beautiful Boim Chapel. In the afternoon is offered an optional Lviv Beer Tour. We will have an opportunity to learn how craft beer is brewed and to taste it and during the tour we will travel from an old monastery of the 17th century to a modern beer brewery. The full day optional tour today takes us to castles around Lviv: Olesko Castle dating back to 13th century and the residence of Polish Kings, like Jan Sobieski. The castle features a magnificent collection of old furniture and paintings, a nice park and a museum with beautiful pieces of jewellery, and Zolochiv Palace – the jewel of defensive architecture, build in 17th century. Over centuries the palace served as fortress and royal residence. In the courtyard we find Grand Palace and Chinese Palace. In the evening enjoy an optional Carpathian farewell dinner at Restaurant Trout, Bread and Wine with its highlight dish, Carpathian trout. Citizens of most countries of Europe and the Americas do not need visa to Ukraine. Citizens of Australia and New Zealand can obtain visa at arrival in Kiev Borispol Airport.